Nothing beats the summer sun like diving into refreshingly cool waters. Sadly, a day by the beach is not always a possibility, which is why a lot of us treat ourselves to the luxury of a backyard swimming pool. But within those two words (swimming + pool) lies a world of possibility. Length, depth, colourful floor tiles, a unique water feature… we are spoiled for choice to turn an ordinary splashing spot into an incredible oasis of style. In addition to cool us off, a swimming pool also adds striking visual interest to a yard, as well as boosts your house’s value (a lot of buyers list swimming pools as a non-negotiable feature). Plus, who doesn’t love a good pool party? 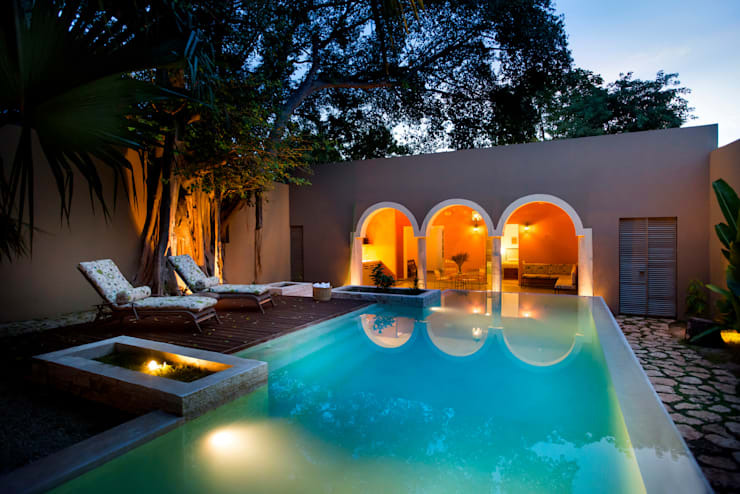 But before we get completely carried away with all the benefits, let’s rather lose ourselves in the cool, crisp waters of 10 stunning swimming pools. 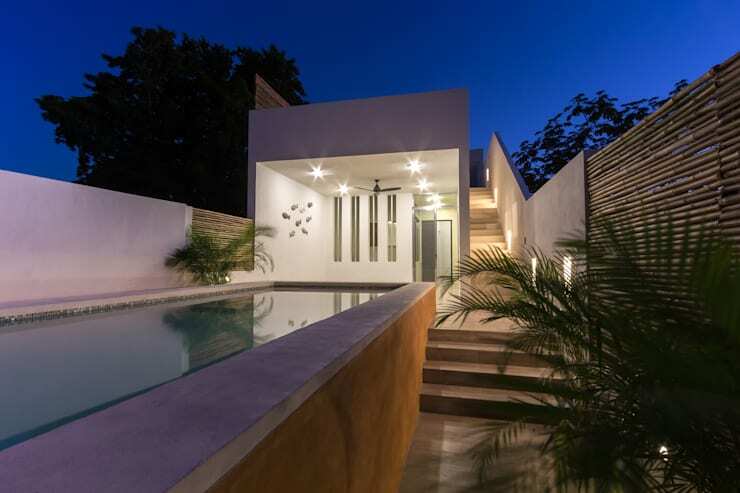 Cervera Sánchez kicks off our list with this stylishly modern pool that manages to blend in with its linear surroundings, yet also stand out most prominently. 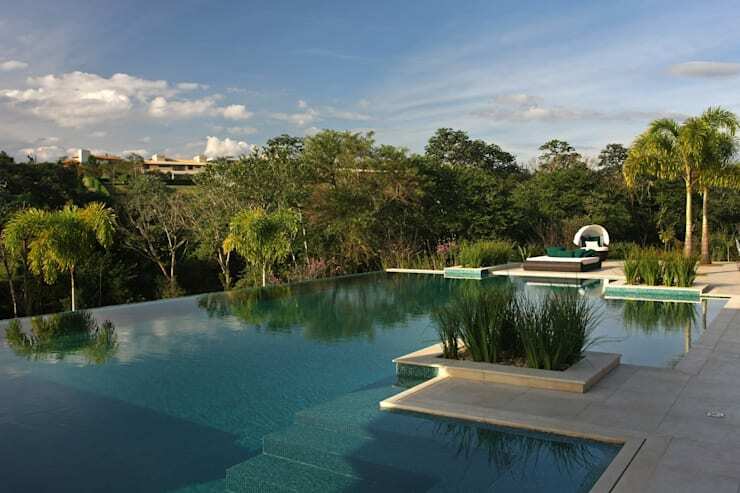 Stone, concrete, and reeds form the foundation for this residence’s facade, with that pool taking splendid care of the social hotspot. This is also perfect proof that you don’t need a hot sun beaming down on those blue waters to construct the perfect swimming spot. Who says a swimming pool needs to be in the back yard – or outside, for that matter? 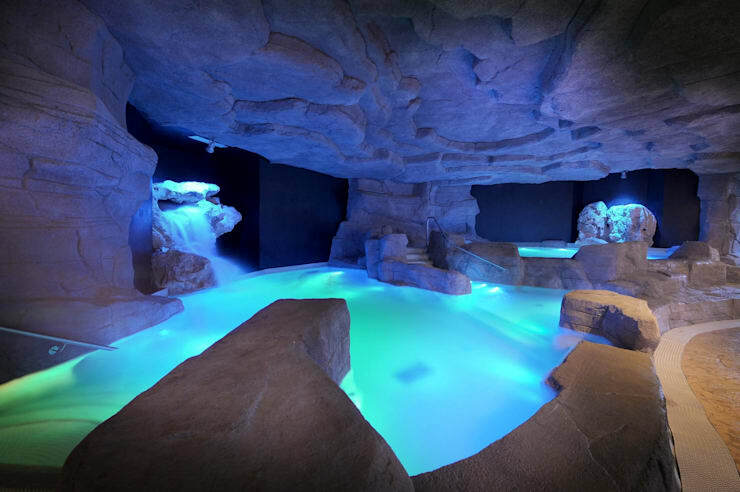 Rocks and lighting magically transform this pool into an undersea adventure, equally suitable for youngsters with active imaginations, or adults seeking out an exciting splashing spot without the harsh rays of the sun. No need to feel claustrophobic in this pool, as that infinity edge gives the effect of endless waters stretching into the horizon. And what better backdrop than some lush trees to round off the perfect summer afternoon? 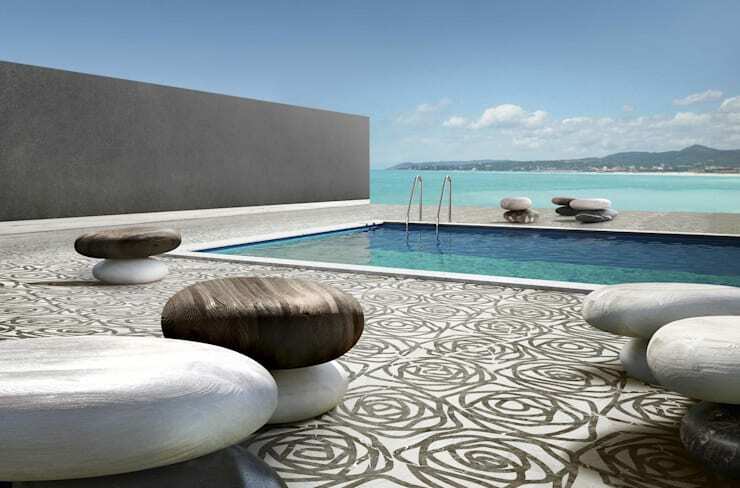 And for those who want to do more than swim, a chic tiled surface and stylish daybed lounger offer up ideal sunbathing spots. Shame on those who think a pool is nothing more than a hole in the ground. With the right additions, your swimming pool can be transformed into a lagoon-like, natural setting, such as the example shown above. Those craggy rocks and lush vegetation will make anybody forget that their swimming spot is city-bound. … can stay up! 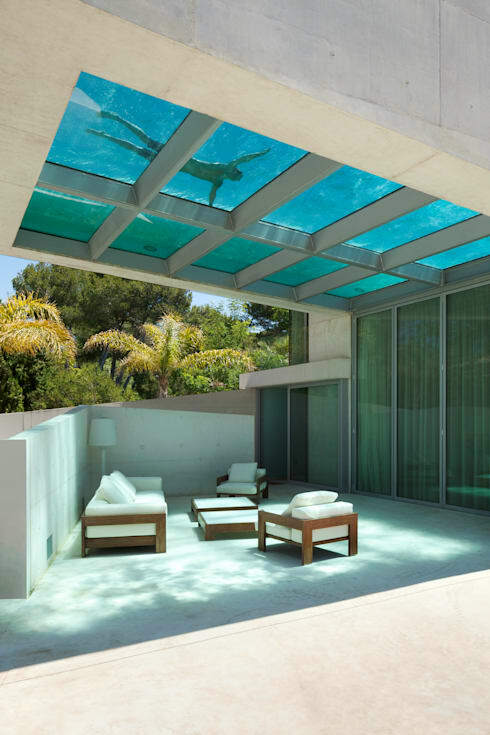 Wiel Arets Architects command us to take a second look with this fantastically placed pool – on the roof! Floating high above your sunbathing friends undoubtedly invokes a flying sensation. And because the pool has a glass floor, it means the lounging area beneath is blessed to be bathed in a tranquil blue illumination of a sun-and-water mix. A plain rectangle in the ground is just the starting point for this beauty – add some striking tile patterns, unique balanced rocks, and an ocean view that commands tranquillity, and you have a spa-like setting where any dip or tanning session is sure to lower those stress levels considerably. Seeking some calmness? Then check out: Serenity Inside the Zen House. Being shipwrecked is no fun, but having this view for your surroundings is most definitely amazing. 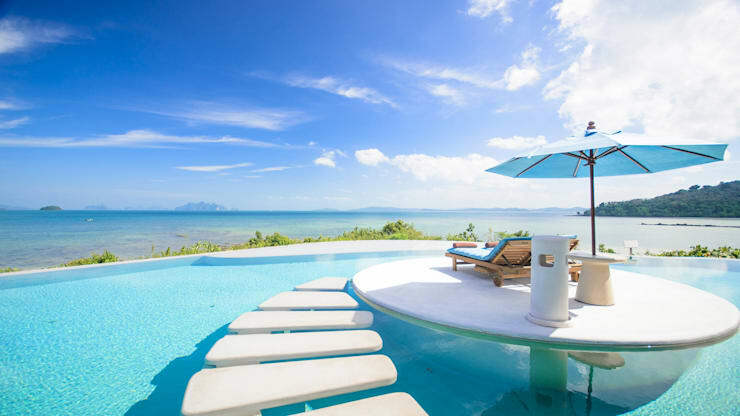 Cool skies and clear ocean blend subtly with the crispiness of the pool’s waters, while a lounging area ensures you’re smack in the middle of this oasis-like scene. And some stylish stepping stones means not so much as a toe needs to get wet if sunbathing is all you’re interested in! The magic of palm trees is (fortunately) not restricted to tropical islands. Mixed with a lush garden, thatched roof, and crystal blue swimming pool, those backyard palm trees instantly transform your house into a tropical resort. And don’t overlook that grand swimming pool, with adequate space to accompany not only those who feel like splashing about, but also those wishing to practice their breaststroke. Get halfway to heaven (and then splash about) with this gorgeous setting. A striking swimming pool, complete with wooden deck and fresh lawn, with a view that allows you to gaze at the picturesque landscapes far below. Splendid mountains on the horizon complete this scene perfectly, crafting a most marvellous space where we can dive into some tranquillity, or enjoy a sundowner while taking in the scenery. Romance takes an al fresco approach with this striking swimming space. The cool blueness of the pool contrasts most effectively with the warm lighting of the covered dining area, both of which can make for a romantic evening outside. Strategically placed plants and exterior lighting interrupt the pool area ever so lightly, while a wooden deck and stony surfaces ensure the best of both worlds on either side!